Tell me, what is better than a good old summer food festival? Sipping on cider or Pimms. Navigating stalls tempting you with incredible smells. Basking in that classic English sunshine. Unfortunately for this blog post, the English sun is a shy and fragile creature, and yesterday had been chased away by some mean rain clouds. It meant that the North Leeds Food Festival was a bit wetter than planned, but no rain is going to keep me from my food! I discovered NLFF on Leeds List, which is quickly becoming my online best friend. The focus of this festival is on the local area. Apparently almost 100% of the money spent at the festival staying in the North of England – whether it’s food, drink, crafts, entertainment or any of the other suppliers. A bit of info first – the festival is running until Sunday (21st August if you’re reading this at a later date) and there are more than 50 “market stalls”, plus 20 additional “street food stalls”… plus bars, local crafts, activities for kids and live entertainment! Not to mention that the Friday tickets, at just £2, were a ridiculous bargain. Being a total Leeds newbie, I hadn’t actually been to Roundhay Park before. Naturally I got completely lost. My rookie error was getting off the bus as soon as I saw the park. I set off in one direction (basically at random) and wandered around for about 20 minutes looking desperately for the sights and smells of the festival. No luck. I did get to discover the sheer prettiness of the park though – in the sunshine I’m sure it’s even more stunning. It wasn’t until my friend Judith arrived, asked where I was, and helped me navigate my way to the festival tucked down in the southern most part of the park. Amusingly, if I’d stayed on the bus just one extra stop, I’d have spotted it #facepalm. But I got there in the end! We showed our tickets and made our way in, just as the rain stopped! We headed for the closest row of stands, which turned out to be “Market Street”. At the first stand we approached, we were offered tasters, which set the tone for the first part of our visit – shamelessly try everything and promise to come back later. (We genuinely did go back later, so don’t disapprove of us too much). One of the first stalls we stopped at was Taylor & Bennett. I saw the macarons and zero-ed in. It’s just plain impossible to resist maracons, and I made sure to go back and buy a box. I also picked up a bar of their 70% Dark Chocolate with Coffee and Cacao Nibs for TC (mostly so I could steal some). I wish I’d remembered to come back to La Picanteria. Their speciality is exotic chilli peppers, and they let us taste a couple of their salsa. The smokey one I tried was incred, but sadly I forgot about them when we went back around. Now, I need your advice for the next stand. Riverford delivers organic vegetable boxes right to your door. I’m always super tempted by ideas like this – quality food for zero hassle! But I’m on the fence… what do you guys think? There were also a couple of non-foodie stalls in there too, such as the absolutely stunning My Posh Pots (which have been unceremoniously added to my birthday list). Turning down the side, we tried some matcha tea for the first time, at EatClean Tea. I’d heard about it before – it’s popular in Japan. It’s a cold tea made from ground green tea leaves, and here was flavoured with either mint or ginger. Unfortunately it wasn’t my (pardon the pun) cup of tea, but then I’m not a big mint/ginger fan. Our purchasing hold-out collapsed when we spotted a cider stand (Thistly Cross Cider). Judith said it might not be a good idea… I completely disagreed! They gave us a couple of tasters each, and while Judith loved their Whisky Cask Cider (matured in whisky casks to imbue it with flavour), I got a half pint of their super apple-y Traditional cider. This whet our appetite, and the hot food stands were right there… so we stopped with the market stalls for a bit in favour of lunch. There was SO MUCH CHOICE. Boutique mac and cheese, fancy grilled cheese, mussels, burgers, Yorkshire pudding wraps, pie, pizza… yeah, I don’t know how we picked either. Eventually we settled on a dish neither of us had tried before, and that we were unlikely to see again soon – poutine from The Gravy Train. Everyone’s had chips, cheese and gravy before (right? ), but this Canadian dish is a cool twist on that. It subbed out the cheese for cheese curds. There were options with tons of additional ingredients like chorizo and chilli, but we kept it simple to see what the dish tasted like plain. Verdict? Pretty damn good! Whoever thought of putting cheese curds and gravy on chips was a master of food. It had started drizzling again by this point, but we found shelter under a marquee and listened to some of the live music on offer – bonus. There were some stands in the middle of the field, but the rain dissuaded us from going to have a poke around. According to the festival map, these were mostly entertainment aimed at kids, as well as the charity supported by the festival, Mind. The rain did put something of a dampener (lol) on the day, unfortunately. The hay bales scattered around as seating didn’t look very tempting post-downpour, and it was a little awkward crowding around stalls holding an umbrella. But on the plus side, it was a bit quieter than we expected, and we hardly had to queue to get our grub at all! I hope it clears up over the weekend for the sake of those poor soggy stallholders. Our last stop was one I had been looking forward to. Half the reason I’d traipsed all the way to Roundhay on a rainy Friday was to seek out Sweet Pizzas, who’d sweet talked me (my puns are on fire) with the offer of a half price slice. With that, we returned to the couple of stalls I mentioned above, and also picked up a slice of Welsh Dragon Pie for lunch at the Megagame today. I meant to save my slice of sweet pizza for a snack then too, but couldn’t help but unashamedly devour it on the bus home. One word of warning – you’d better have as much of a sweet tooth as me as they are very very sweet! Thanks to the organisers of North Leeds Food Festival – even with the rain we had an awesome time. I might even head back there on Sunday to grab some of those chillis (and some more delicious food from the street food section). 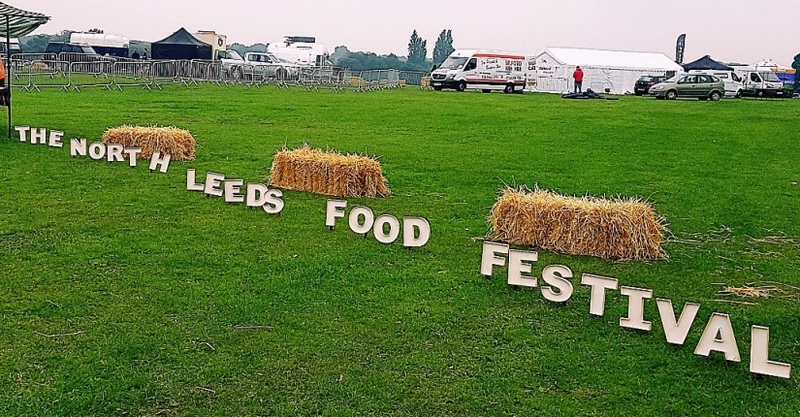 North Leeds Food Festival takes place Fri 19th to Sun 21st August at Roundhay Park, from 10am to 7pm each day. Tickets available online here or on the door.